Central location on the Costa del Sol, close by the main Costa del Sol hospital. A fairly big operation e.g. with several tennis courts and golf tuition facilities adjoining the clubhouse. Mid-priced, with lots of price offers typically available. The clubhouse itself is large and spacious (non-cramped). Marbella Country Club is an unusual club where I think the golf course itself is not quite up to the same standard as the rest of the club. The first 9 holes are fairly up-and-down, the second 9 much flatter. On the first 9 you need accurate shots to avoid losing golf balls – and drives require significant carry to give you any kind of decent 2nd shot. Fairways on the first 9 holes have significant slope (angle left/right – or convex/concave fairway shape) and elevation (playing up or down towards the green). On the first 9, the rough is tough. That means if you get your shot slightly wrong, you can be penalised hard. Definitely not easy for a high-handicap player, or if you have not played the course enough times to know how the ball is going to run after landing on the fairways. The second 9 holes play easier, although several greens there are elevated to add back in some difficulty. 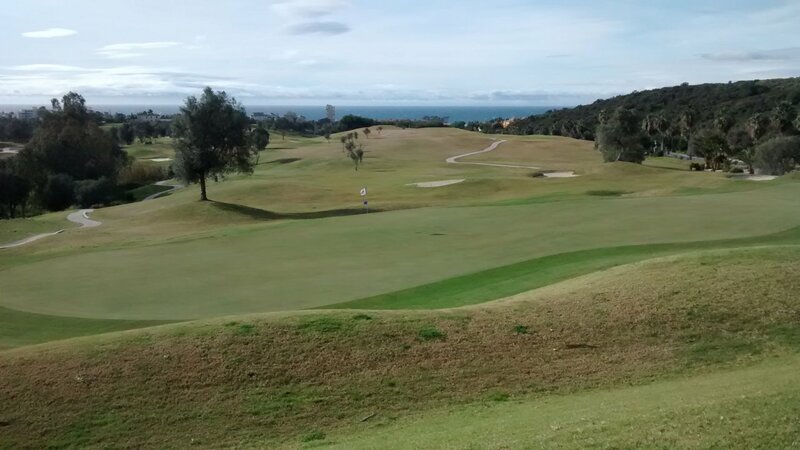 The greens are high quality – very smooth, large, quite fast and shaped for a good variety of possible pin positions. Fairways are generally well-grassed and nicely mowed. The course is quite busy (a fair number of tour parties play here, for example). 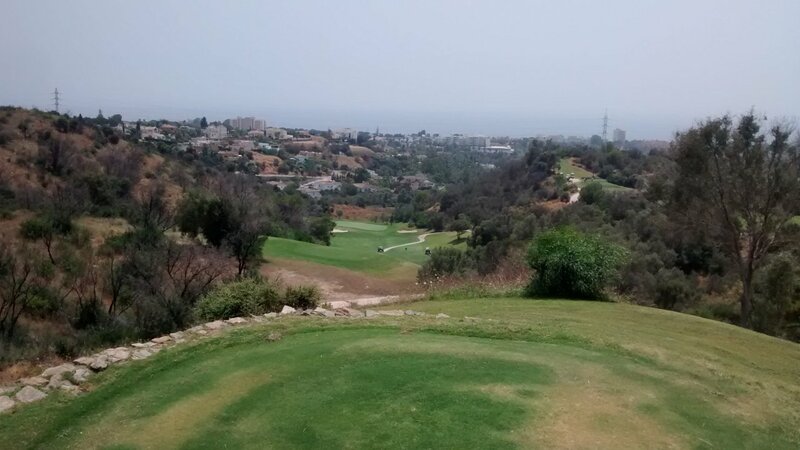 On balance, a low-priority course for me, but then I play quite a lot of golf down here (about 70 rounds a year) and make a point of visiting lots of courses to review them. I write my reviews primarily for people thinking about playing a course for the first time. 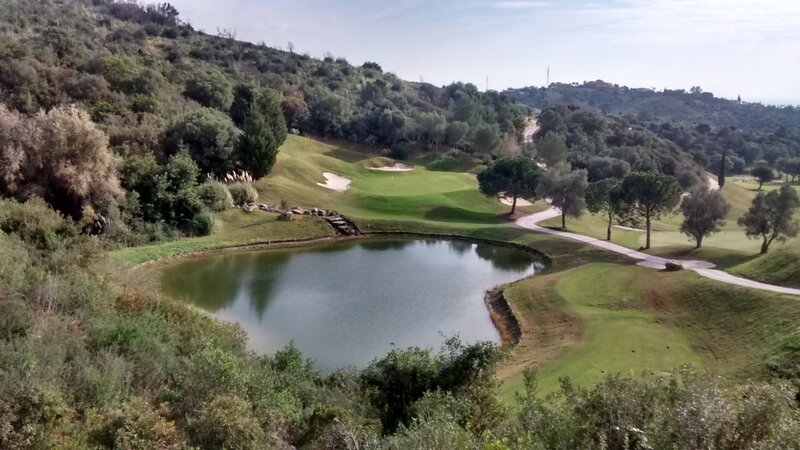 Marbella Country Club is definitely not an easy course to play first time out, unless you play with someone who knows the course well or buy a detailed course map booklet. There are a lot of holes where you need help to determine the best line to hit your golf ball from the tees and from the fairways. First time players will really struggle on this course without that help, particularly if they are high handicappers (25+). Low-handicap players can still carve out a good round of course. They will have to play a careful, thinking round to do that. This is no bad thing – the course is definitely a challenge for even good golfers. Golfers who play Marbella Country Club regularly and know the whole course well I guess know the subtleties of shots that work on each hole. Note: There are two different golf clubs on the Costa del Sol with very similar names - Marbella Country Club (this one) and Marbella Club. These are unrelated clubs. Review last updated: August 2015. Number of times played: 8. Marbella Country Club is represented by the yellow dot. This shows the course as less than average difficulty and length compared to all other courses on the Costa del Sol. An 18-handicap player can expect to go around this course at 18 over par. IMHO this 'official' difficulty understates the true relative difficulty of this course quite a bit.